The William Pitt Union briefly closed again after issues with a sprinkler Monday morning. The University released a comment via its official Twitter account at 5:53 a.m., saying the lower level and basement level of the building would be closed until further notice. The two floors reopened less than two hours later. The Forbes Avenue entrance, however, remains closed as of Monday night and is marked off with caution tape. University maintenance was able to clear the mound of ceiling panels and insulation that littered the entrance floor from the early hours of Monday morning, however the gaping hole in the ceiling still remains. A university spokesperson could not be reached in time for publication to get information on when the entrance will be reopen. This marks the second time in two days that parts of the William Pitt Union had to close. 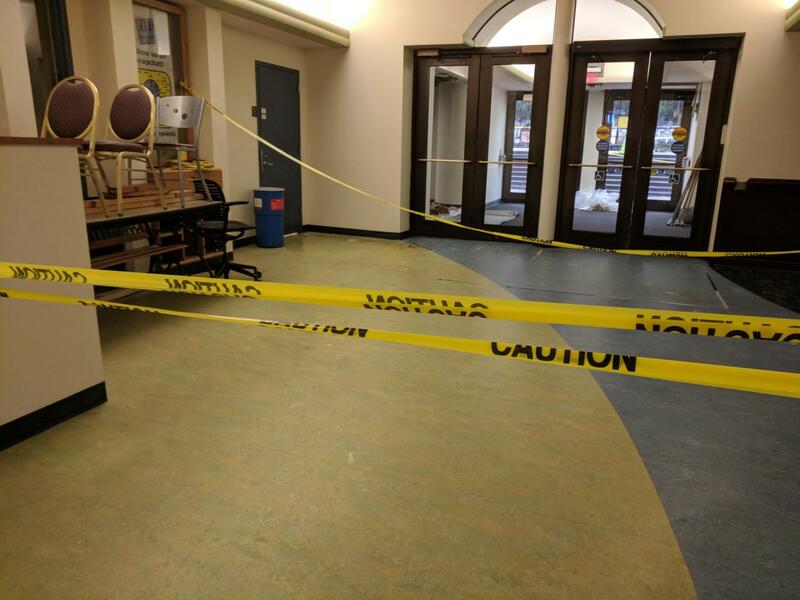 While students were still returning back to campus before the official start of the spring semester, a waterline broke Sunday, Jan. 7, causing flooding in some areas of the bottom two floors. Water streamed across the walkway above the Union’s ticket office and flowed down the stairs to the lower level and basement level floors. Pitt tweeted about the building’s closing, and said repairs were made immediately so the Union could be opened Monday morning.